Deciding what to do after university can be daunting, especially when you consider the endless opportunity. Graduates looking for guidance and a taste of what a real-world career might be like can gain invaluable experience through graduate programmes like those run by Lloyds Bank. From learning how to lead, to coding next generation banking products, Lloyds Bank have eight different streams giving graduates an opportunity to shape their future in a leading-edge organisation looking to recruit the cream of the crop and support them in gaining a viable and rewarding career. 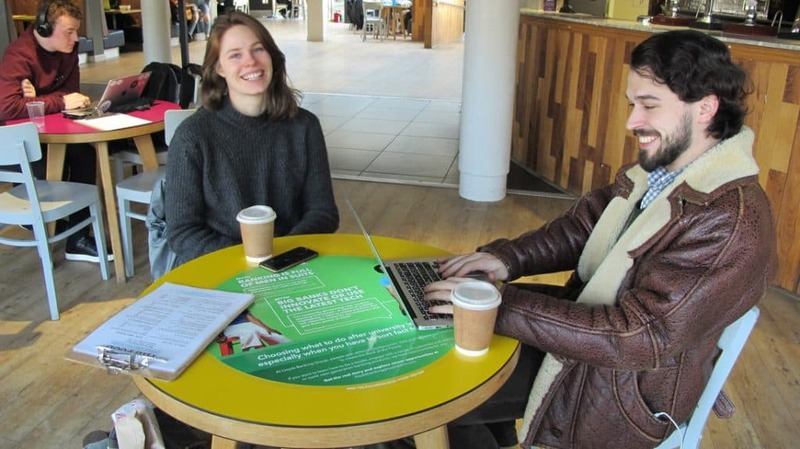 As the UK’s biggest digital bank, renowned for embracing innovation, it makes sense that a format like Tablewrap in University Student Unions would appeal. Tablewrap puts messages in the centre of conversation, dominating share of voice in the student union. Reaching groups of students socialising or studying together, mobile phones, laptops and tablets are naturally found on the table in direct proximity to the message. This acts as a prompt to spark conversation amongst peers and drive instant engagement online. Named in The Times Top 50 list of Employers for Women for the sixth consecutive year and recognised as the World’s Best Bank for Diversity and Inclusion at the Euromoney Awards for Excellence in 2017, Lloyds Bank is clearly committed to diversity and equal opportunities – something which is highly topical and evident in the campaign message. Naturally, advertising on Tablewrap in University Student Unions across the UK allows Lloyds Bank to reach a diverse mix of graduates in a high dwell environment where wrapping the tables delivers stand out impact. The campaign is running in key universities across the UK throughout the month of February.